Liquid ring vacuum pump introduce- Vacuum Pump - EVP Vacuum Solution! The liquid-ring vacuum pump is a kind of coarse vacuum pump, which can obtain the limit pressure of 2.66-9.31 kPa for single-stage pump and 0.133-0.665 kPa for double-stage liquid-ring vacuum pump. The liquid ring vacuum pump can also be used as a compressor. It belongs to a low pressure compressor. Its pressure range is (1-2) X105Pa gauge pressure (under specific conditions). The liquid ring vacuum pump has been widely used in many processes of petroleum, chemical industry, machinery, mining, light industry, paper making, power, metallurgy, medicine and food industries, municipal and agricultural sectors, such as vacuum filtration, vacuum feeding, vacuum degassing, vacuum evaporation, vacuum concentration and vacuum moisture regain. The process of compressed gas in water ring pump is isothermal, so it can extract flammable and explosive gases. In addition, it can also extract dusty and water-bearing gases. 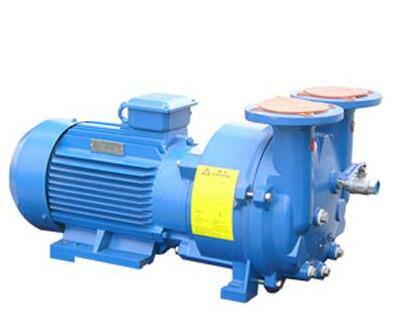 Therefore, the application of liquid ring vacuum pump is increasing day by day. The impeller is eccentrically mounted in the pump body. When the impeller rotates, the water entering the pump body of the liquid ring vacuum pump is thrown around by the impeller. Due to the centrifugal force, the water forms a closed thickness of the same thickness as the pump chamber. Water ring. The upper inner surface of the water ring is just tangent to the impeller hub, and the lower inner surface of the water ring is just in contact with the blade tip (in fact, the blade has a certain depth of insertion within the water ring). At this time, a crescent-shaped space is formed between the impeller hub and the water ring, and this space is divided by the impeller into a plurality of small cavities equal to the number of blades. If the upper part of the impeller is 0°, the volume of the small cavity gradually becomes smaller and larger, the pressure is continuously reduced, and the air inlet of the suction and exhaust disk is connected with the small cavity. The pressure in the space is lower than the pressure in the pumped container. 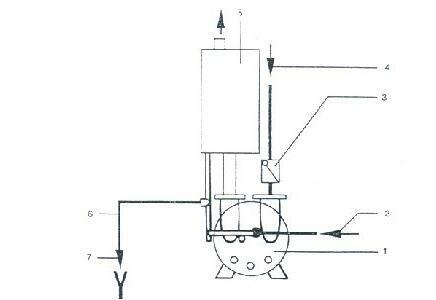 According to the principle of gas pressure balance, the pumped gas is continuously drawn into the small cavity, and is in the process of inhalation. When the inhalation is completed, it is isolated from the suction port. From the section, the volume of the small cavity is gradually decreasing, and the pressure is continuously increasing. At this time, the compression process is in progress. When the compressed gas reaches the exhaust pressure in advance, the auxiliary row is discharged. The air valve is vented in advance. From the cross section to the volume of the small cavity communicating with the exhaust port, the pressure is further reduced further. When the pressure of the gas is stronger than the exhaust pressure, the compressed gas is discharged from the exhaust port, in the continuous flow of the pump. During the operation, the process of inhaling, compressing and exhausting is continuously carried out to achieve the purpose of continuous pumping. Generally, rubber ball valve is used. Its function is to eliminate the phenomenon of over-compression and under-compression during the operation of the pump. These two phenomena can cause excessive power consumption. Because the liquid ring vacuum pump has no direct exhaust valve, and the exhaust pressure is always fixed, the compression ratio of the liquid ring vacuum pump depends on the termination position of the intake port and the starting position of the exhaust port. However, these two positions are fixed, so they are not suitable for the need of the change of the inhalation pressure. In order to solve this problem, rubber ball valves are usually installed under the exhaust outlet, so that when the exhaust pressure is reached too early in the pump chamber, the ball valve opens automatically and the gas is discharged, eliminating the phenomenon of over-compression. Generally, the compression ratio is determined by the lowest suction pressure in the design of water ring pump, so as to determine the starting position of the exhaust port, thus solving the problem of insufficient compression. The liquid ring vacuum pump and compressor system are composed of vacuum pump (compressor), motor and gas-water separator pipeline, as shown in the figure. The working process of the liquid ring vacuum pump, compressor and gas-water separator is as follows: gas enters the liquid ring vacuum pump or compressor through the pipeline through the valve, then enters the gas-water separator through the exhaust pipe, and discharges through the exhaust pipe of the gas-water separator. When used as a compressor, the gas-water mixture discharged by the compressor is separated in the gas-water separator, and the gas is conveyed to the system requiring compressed gas through the valve. The working water in the liquid ring vacuum pump or compressor is discharged from the gas-water separator without cooling to the vacuum pump for reuse. The rest of the working water is supplemented by the water supply pipe. The size of the water supply is adjusted by the valve on the water supply pipe. The difference between the gas suction and the pressure feeding system is only that the internal structure of the gas water separator is different. When sucking gas, the suction port pressure is lower than atmospheric pressure, while the exhaust port pressure is equal to atmospheric pressure, and the gas-water separator has overflow pipe; when pressurizing gas, the suction port is atmospheric pressure (or vacuum state), and the exhaust port pressure is higher than one atmospheric pressure. In order to ensure the transmission gas pressure, the water level of the gas-water separator passes through the overflow switch. Control.